Each door assembly shall include the door leaf (or leaves), frame, anchors, hardware, and accessories. It shall be provided by a single manufacturer. The complete door assembly shall be capable of transferring blast and rebound reactions to the adjacent supporting structure (wall, and/or floor, and/or ceiling). Resistance to blast and/or missile strikes shall be demonstrated by design calculations. The door leaf (or leaves) shall overlap the frame to mitigate the door becoming inoperable due to the frame being knocked out of square by a blast and wedging the door leaves in place. Single leaf doors have one door leaf in one frame. They may incorporate a raised steel threshold for the purpose of extending the door seal around the bottom of the door. Or they may have a flat threshold with an adjustable rubber sweep. Double leaf doors have two opposing door leaves that are hinged on each jamb. The active leaf is the one with the deadbolt lock and/or astragal. They may incorporate a removable or non-removable mullion. They may incorporate a raised steel threshold for the purpose of extending the door seal around the bottom of the door. Or, they may have a flat threshold with an adjustable rubber sweep on each door leaf. The door will be provided with a set of completed calculations taken from Structures to Resist the Effects of Accidental Explosions; UFC-03-340-02. These calculations will be signed and stamped by a professional structural engineer from the state where the door will be installed. Included in the calculations will be sections for the rebound load and the anchorage to the supporting structures (wall, floor, and/or ceiling). The door provider's responsibility ends at the anchorage. The door will be provided with a set of calculations taken from Design of Structures for Missile Impact, BC-TOP-9A; Revision 2. These calculations will be signed and stamped by a professional structural engineer from the state where the door will be installed. A drawing package will be supplied with the calculations. 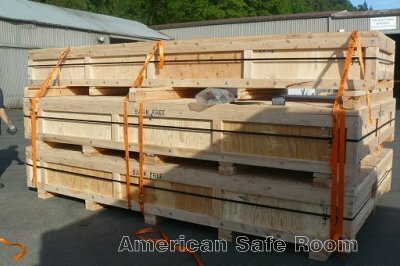 Included in this package will be the envelope dimensions, clear opening dimensions, material call outs, anchorage locations and specifications, hardware, door swing out, and estimated operating forces. The door leaf (or leaves) shall be made from solid homogenous plate steel. It will resist the effects of the provided blast and missile strike loads in the elastic range of the steel. It will transfer the energy from a blast load uniformly to the frame. The frame shall be fabricated from steel angle with one leg supported by laying flat on the wall and the other leg of the angle extending into the rough opening. If the anchorage is engineered fasteners, holes shall be provided that are located so the fasteners are within the manufacturer’s recommended standoff distance from the unsupported edge of the rough opening. 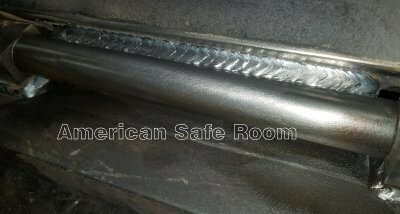 If the anchorage is weldment, no holes shall be provided in the frame. Door and hardware shall be shop assembled by the manufacturer to insure proper contact, clearances, alignment, and engagement of the doors as well as smooth operation of latching and locking hardware. Hinges shall have oil impregnated bronze sleeve bearings and stainless steel grease fittings. 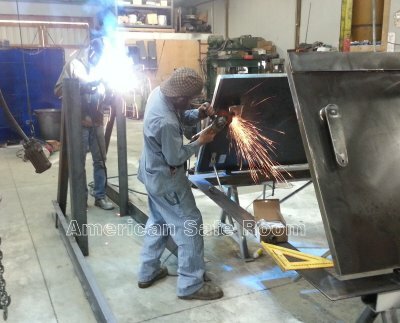 They shall be factory welded to both the frame and door leaf. They shall be engineered by the manufacture to fully support the door leaf throughout its normal operating range and to resist the required unseating rebound load. The latches will be mounted on the door leaf. They shall rotate 90 degrees from the unlatched position to the fully latched position. In the fully latched position, they will engage a cam plate welded to the door frame. This engagement shall draw the door into the frame, compressing the door seal. Each latch will have a bolt that adjusts the tension. 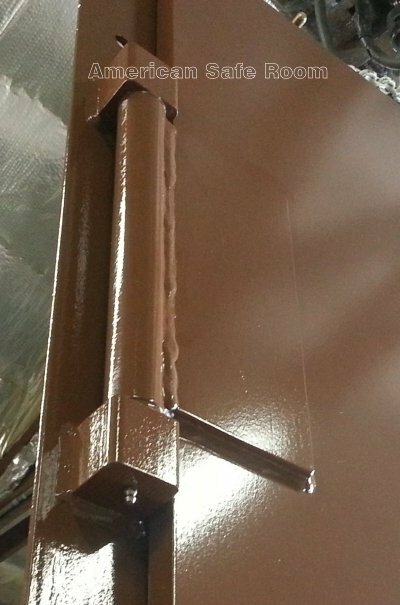 For doors requiring operators on both sides of the door leaf, a steel shaft shall be mounted in a steel barrel that has oil impregnated bronze sleeve bearings at each end and a stainless steel grease fitting. They shall be engineered by the manufacture to resist the required unseating rebound load. The door seal shall be a closed cell EPDM rubber strip. It shall be applied to the frame where the door leaf overlaps the frame. There shall be a steel-on-steel stop welded to the door leaf so the door seal does not get over-compressed when the door is closed and latched. The compressed thickness shall be within the manufacturer’s specifications. Standard surface prep and durable shop coat primer. Standard surface prep, durable shop coat primer, and a top coat of paint. Full sandblast surface prep and zinc rich primer. The door shall be set up in a test stand and 10 full operation cycles shall be performed. If more than one door is supplied, the doors shall be indelibly marked on the frame to differentiate each door. A representative from the customer or contractor shall witness this testing or a video inspection of the doors shall be provided by the manufacturer to the customer prior to shipping. This inspection may be completed prior to finishing so the finish is not impacted by the test. 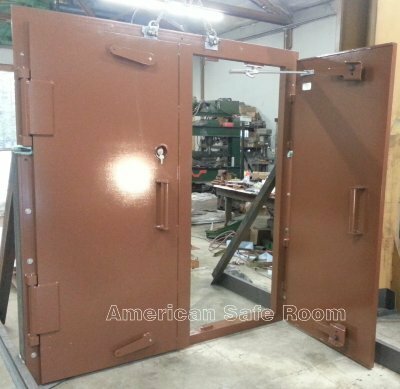 The door shall have removable or non-removable pick points to lift it into place for installation. The location of these points shall be determined by the manufacturer to be as close as possible the natural balance point of the door assembly. The latching hardware shall be fully engaged whenever the doors are lifted. The packaging shall be appropriate for the shipping method. 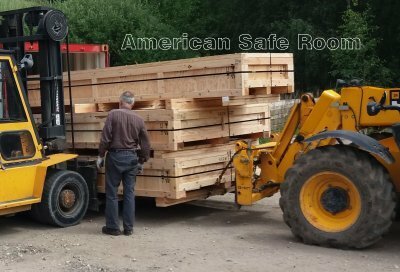 Flatbed truck shipments may only require cribbing, LTL truck shipments may require palletizing, and international shipments may require full crating with certified lumber. 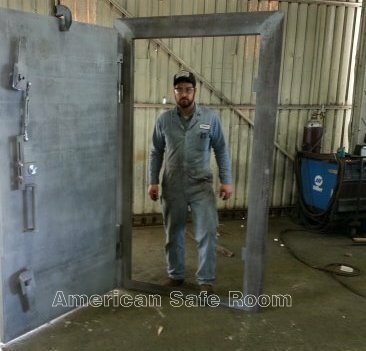 For a quotation, please send your specifications to our sales department (sales@AmericanSafeRoom.com) or call 541-459-1806.